This portion of the procedure continues extracorporeally. The staple lines are removed and the lumen of the bowel is cleansed using a suction-irrigation device. Care is taken to preserve the proximal 10 cm as a Studer limb. The remainder of the segment is incised along its antimesenteric side using monopolar electrocautery. The posterior plate of the neobladder is created by suturing the medial edges of the detubularized bowel in a running fashion with 2-0 polyglactin such that the bowel forms a "J" configuration. The anterior plate of the neobladder is closed using another running 2-0 polyglactin suture. The anterior enterotomy is left open for approximately 3 cm at its inferior most portion in order to create the urethroneovesical anastomosis. The neobladder is reintroduced into the abdominal cavity. The lower midline incision is closed using a 0- polyglactin suture, penumoperitoneum is re-established, and the camera is replaced. 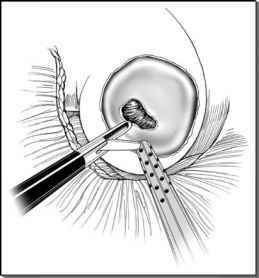 The urethroneovesical anastomosis is performed intracorporeally.